After analyzing 176 career track records of high-level state employees. several interesting patterns are beginning to emerge. This is the first part in a series entitled ‘Russia’s Personnel’, which aims to answer a vital question: Who governs modern-day Russia? Extensive access to state personnel records enables us to evaluate the individual quality of human capital across Russian institutions with a degree of confidence. At this stage, we have analysed 176 career biographies. Our focus has been on those employed in the presidential administration, the government, state corporations and the governor pool. The main and most significant problem in the analysis lies in the ‘blanks’ in the biographies of many officials and employees of state corporations. According to the analysed biographies, not everyone went to university right after leaving school or military service (the two ‘blank’ years after graduation or the dates of service specified in the biographies). Moreover, many officials indicated only the start date of their work in public administration, e.g. omitting their work experience in the commercial sector in the 1990s. Therefore, an exhaustive study of biographies of all officials does not seem possible at present. However, so far we have managed to find out that 33% of all personnel obtained their first university degrees in technical fields, 19% and 18% got degrees in law/public administration and economics/finance, respectively. 11% received their degrees in the field of international relations or history. The same figure (11%) graduated from military educational institutions (KGB, Ministry of Internal Affairs, Armed Forces). Others received their degrees in agriculture, medicine, languages & literature or journalism. 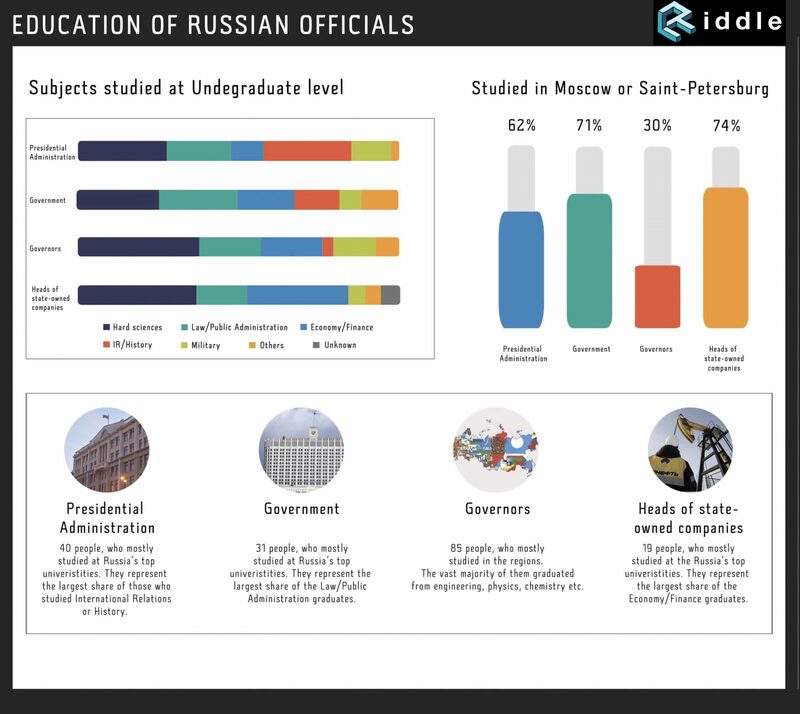 The heads of state corporations turned out to be most closely linked with the capital cities: 74% of them graduated from universities in either Moscow or St. Petersburg. The presidential administration turned out to be strongest in the humanities. 11 leaders hold degrees in international relations or history. The largest number of economists and financiers is found among the heads of state-owned companies. After the collapse of the USSR, most state administrators received post-graduate qualifications (31%). Or they obtained doctoral degrees or advanced research degrees (9%). Among the governors, 44% received post-graduate qualifications. Most of them did so without interrupting their main professional activity. Law and public administration (central or local) turned out to be the most popular fields. Interestingly, the governor of St. Petersburg Georgy Poltavchenko and the president of Transneft Nikolay Tokarev opted for post-graduate programmes offered by the KGB. Tokarev studied with Sergei Naryshkin, and served in Dresden with Putin. Poltavchenko met Putin only in the early 1990s, being the head of the Viborg KGB administration at that time. The presidential administration turned out to be most ‘academic’. 25% of the managers there hold research degrees. In this case, according to Dissernet, more than 80% of theses submitted by all senior officials and deputies are falsified. For example, in the dissertation submitted by the governor of the Moscow region Andrei Vorobyov as many as 107 out of the 165 pages were plagiarised. Accordingly, governors turned out to be least prepared for to run state administration in terms of their first degrees. ‘Typical’ governors are native of the regions and often head the region where they were born or had professional connections. There are three active regional leaders who are graduates of the highest party school of the Communist Party of the Soviet Union: Oleg Korolev from the Lipetsk region, Alexandr Mikhailov from the Kursk region (Rostov Higher Party School), and Svetlana Orlova from the Vladimir region (Khabarovsk Higher Party School). How does this correlate with existing scholarship on Putin’s personnel policy? At present, most works on the subject can be split into two groups. On the one hand, Andrei Kolesnikov discusses the ‘autopilot’ mechanism in Russian governance. The system responds to external and internal challenges without the President’s active participation. 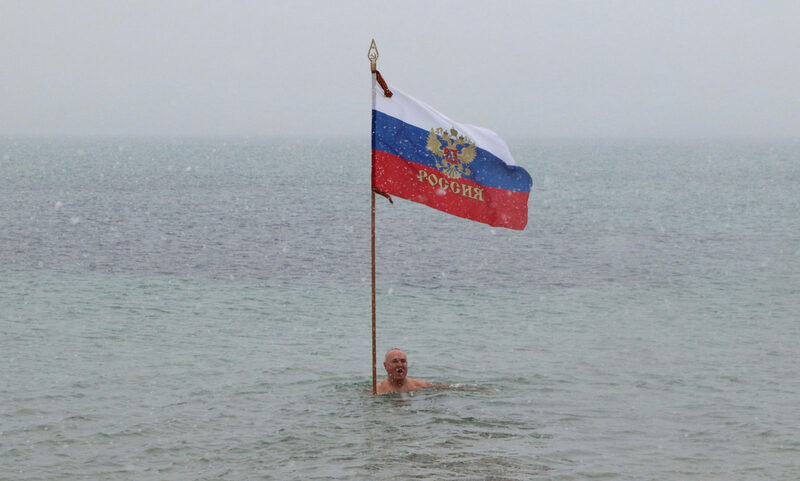 According to Kolesnikov, the current system will run off its own steam: Putin’s system is ideologically incapable of modernisation, and it does not enter into dialogue with society as an institution. This reduces any chance of absorbing relevant feedback. Konstantin Gaaze is even more pessimistic about ‘putinology’. 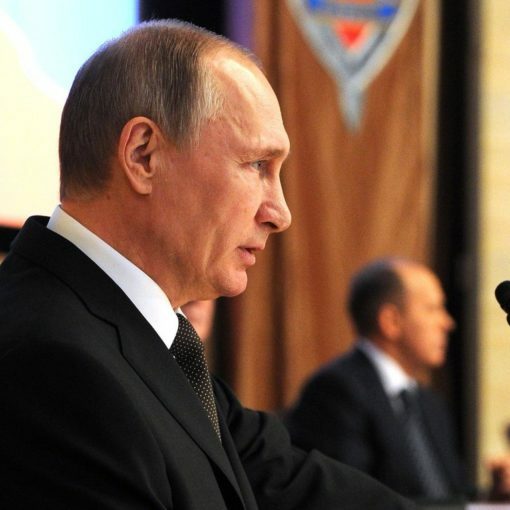 He argues that Putin has weakened control over his ‘night rulers’, i.e. 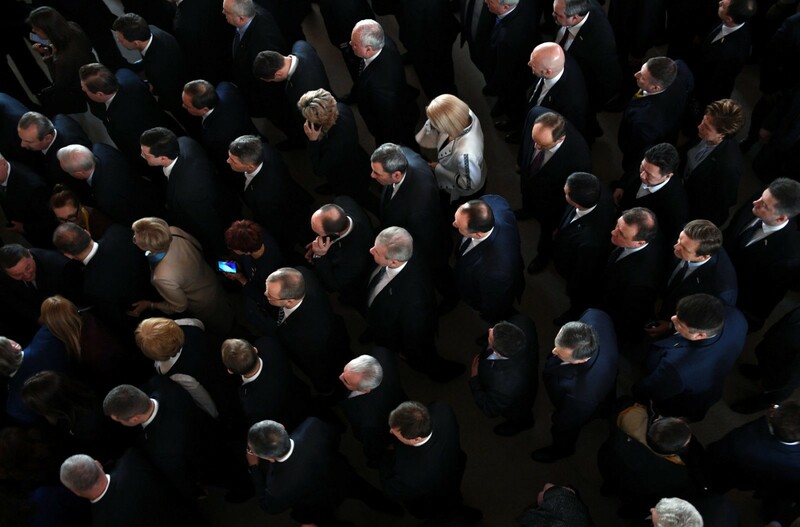 unofficial political players of Putin’s system: the siloviki, the heads of state-owned corporations and other actors who, from the formal point of view, should have no influence over the country’s policy. A more restrained position is presented by Sergei Aleksashenko. 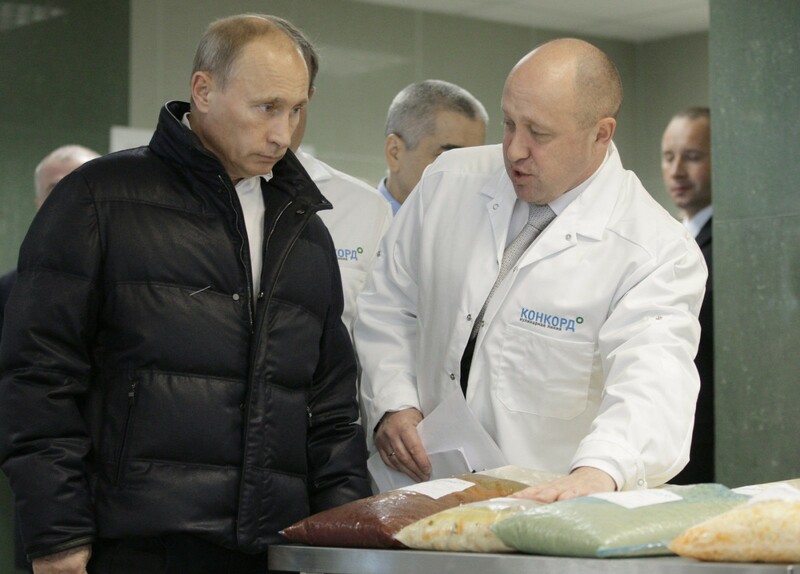 He shows the importance of efficient personnel to maintain the stability of Putin’s system. Fabian Burkhardt, meanwhile, continues Aleksashenko’s idea and notes that the staff were selected only on the basis of their loyalty and systemic embeddedness, rather than meritocratic principles. On the other hand, Tatiana Stanovaya consistently points out the subjectivity of Putin’s political and administrative system. 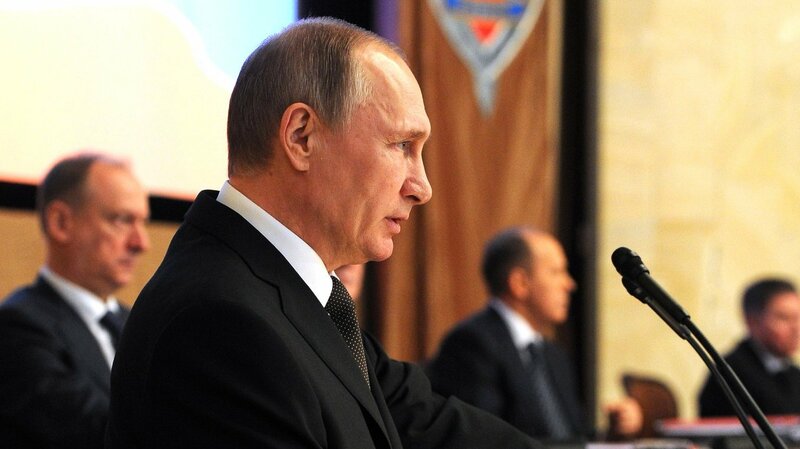 The Russian regime, which is approaching the peak of its consolidation, is preparing for ‘Transformation 2024’. Under these conditions, technocratic efficiency becomes more important than loyalty. Stanovaya shows that the emerging technocratic vertical dependency begins to threaten the old non-systemic elites, who will either have to adapt to the new authorities, or sink into oblivion. As regards state management, Stanovaya continues to argue with Gaaze, proving that governance is now a matter of bureaucracy, while Putin is a historical leader who responds to global challenges. This remote dispute between analysts is a dispute between two views on the origins of political power in Russia. 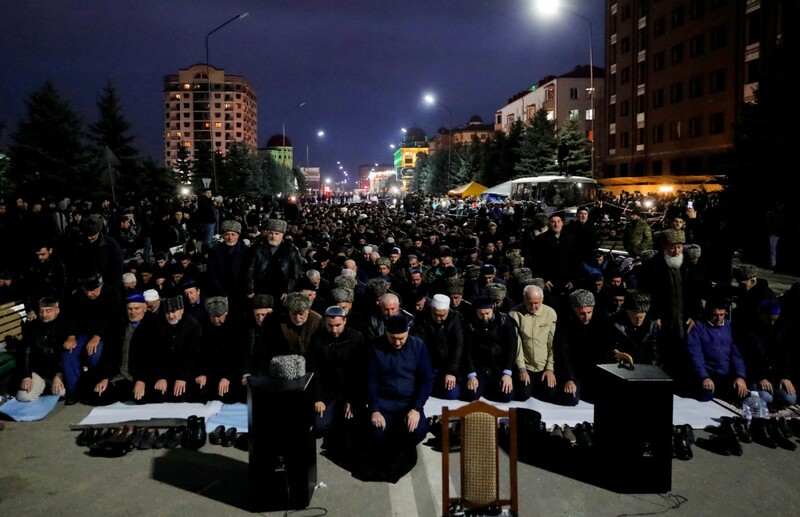 Some believe that the power constructs rivalries between different groups, whose influence is channelled through the existing political system, with Putin being merely a moderator, interested in staying in power. 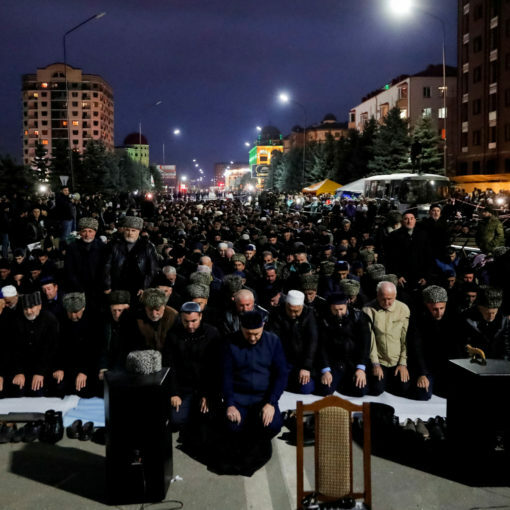 Supporters of the other approach see the Russian president as a more subjective player, noting that the management of the political system is influenced by the President himself (primarily in foreign and military policy) as well as his administration. **However, this dispute is irrelevant in discussing issues related to the effectiveness of public governance. The institutional peculiarity of the Russian political system is that decisions taken by the central power (either by its own will or someone else’s will) are binding and must be implemented. However, the quality of execution has remained consistently poor: according to the World Bank, Russia ranks 106th when it comes to government effectiveness, between Tunisia and the Dominican Republic, behind Kazakhstan, Armenia and Azerbaijan. Political scientists have identified many causes of this ‘inefficient government’ in Russia, describing them in numerous books. Relatively positive examples, e.g. 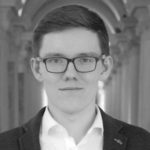 the tax reform and budget reforms in the early 2000s, succeeded only when Putin was politically interested in the success, when responsible and motivated officials were isolated from the influence of interest groups, and reforms quickly brought positive outcomes, which guarded them against early changes. Thus, when discussing any future changes it does not matter if the Russian political system is working in the ‘autopilot’ mode, or if Putin and his administration manually construct the future of Russia. Instead, it is important to know whose hands will build that future. 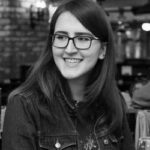 Although we reject the relevance of the dispute over the nature of political power in Russia, the analysis of the influence exerted by particular people or organisations is not devoid of analytical sense. In political science, there is a well-known multiple-streams framework, formulated by John Kingdon in 1984, and seriously revised by Nikolaos Zachariadis later on. According to that framework, any political process can be disintegrated into three streams. The stream of problems has constantly generated problems that call for a government decision. The country’s leaders perceive problems through established indicators (for example, presidential decree no. 548 sets criteria for assessing the effectiveness of governors), certain events (for example, high-profile emergency situations or terrorist attacks) and feedback which analysis the implementation of previous policies. In the stream of decisions, there are programmes and policies that are constantly generated both by the authorities themselves and by external organisations. The choice of these decisions depends on the ease of their implementation and approval by exports who are important for the authorities. Finally, the political stream consists of the influence of public opinion, interest groups and key political players responsible for policies. Therefore, the adoption of any major political decision involves a ‘window of opportunity’, when all three streams can merge and enable the adoption of a decision that is optimal for the government. This process is enhanced by ‘political entrepreneurs’, i.e. people who look for solutions to existing current problems and political allies to help implement such a decision. The peculiarity of the Russian political system is that the same players can often act as important experts, representatives of interest groups and key political players, all at the same time. For example, it is obvious that Igor Sechin is an important expert in the oil and gas policy. However, he often becomes a representative of a group of interests, which was the case, e.g., in the scandalous case of Bashneft privatisation. In the early 2000s, German Gref was an important political entrepreneur (author of the ‘Gref programme’) while at the same time being a key political player in economic issues. Thus, when we talk about the quality of the government staff, it is extremely important to take into account the role that certain players or organisations actually play in the implementation of government decisions. The ability to assess the functionality of government personnel is complicated by the fact that their roles can often change unexpectedly, not only for outside observers, but for themselves. 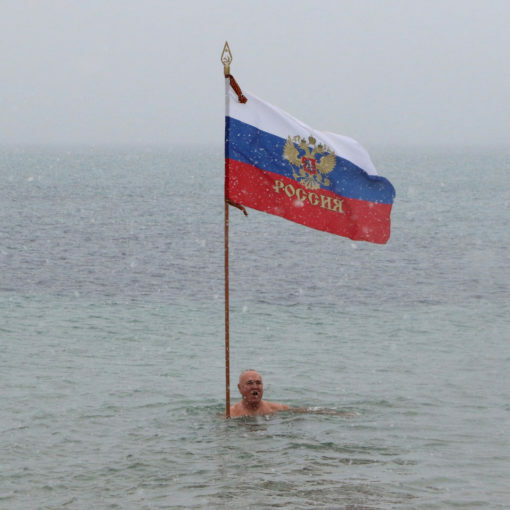 For example, Tatyana Stanovaya shows that the apparent stability in the foreign policy bloc is situational, since the reshuffling is directly related to foreign policy decisions, which Putin does not hurry to take. On the other hand, the effectiveness of Russian government bodies is subject to the influence of independent factors, primarily foreign policy and oil prices. Despite the stagnant economy, Konstantin Sonin positively assesses the performance of the economic segment of the government and the Central Bank, acknowledging their progress in reducing the impact of the 2008 crisis, sanctions, falling oil prices and rising military spending. Finally, the example of defence minister Anatoly Serdyukov shows how a person without any specialised military experience, expected to solve only economic issues in the army, unexpectedly had to carry out the most radical reform of the armed forces in the modern history of Russia. Analysts are left guessing whether Serdyukov was in a position to refuse once he learnt about the prime minister’s and the president’s plans. Sparsely explained instances among Russia’s ruling rank and file like these are a key reason why we believe our continued research is both relevant and necessary, and why we shall continue writing these updates as our further research on the subject gradually unfolds. 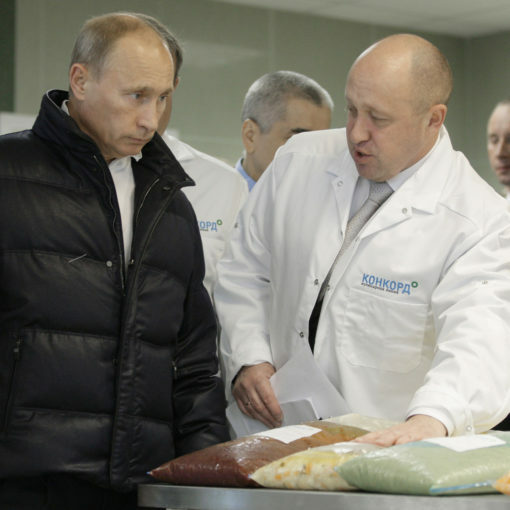 Read the second part of a series ‘Russia’s Human Resources’ – Is Russia a “Militocracy”? What would Kennan say about Putin’s Russia?